Don’t Fight Pride, Resentment and Fear. Do This Instead. During a 12 Step meeting I attended the group was discussing our hopes for learning to live in a state of humility. One man said that humility keeps getting crowded out by pride and resentment in his heart. There was a lively conversation about how to fight pride and resentment. Sometimes fighting the evil actually feeds it. When I work hard to overcome pride and resentment, I am focusing on pride and resentment. The attention I give them feeds them, even if it is negative attention. I judge myself lacking when I dwell on those feelings which can put me into a cycle of guilt and/or shame. Nurturing something positive, instead, works better in my experience. As it grows, it will crowd out the resentment and pride, and fear as well. What is that positive I can focus on? What can I nurture that will swell and grow and leave no room for negative attitudes and feelings? For me it is gratitude. When I fill my heart with gratitude and focus on how grateful I am for the innumerable blessings of my life, it crowds out the tendencies of the natural woman toward fear, pride and resentment. My heart sings with joy when I focus on gratitude, and it isn’t about what I am grateful for. Once I started looking, I saw blessings all around me. No, it is about the feeling itself—the attitude of gratitude! When I cultivate gratitude I am feeding and watering love in my heart. Love for and from God fills my heart and crowds out all negatives. It is an awesome way to live! Do you recognize negative feelings or attitudes in your life? Are you willing to focus on gratitude to crowd those out? List 10 things you are grateful for today. Are you willing to do that every day? Related Posts: Focus: Riding through the Boulders, Practicing Instinctively Turning to the Lord, Gratitude: A Desire to Magnify My Callings, Grateful for My Addiction! Are You Kidding Me? On a recent Sunday morning, I lay in bed pondering before getting up to start my day. My heart was filled with joy and gratitude for the many blessings the Lord has bestowed upon me. I am grateful for a wonderful husband. We complement one another in so many ways. Our marriage is a blessing to each of us. We are both aware of it and frequently share these feelings with one another. I am grateful to be a mother and step-mother. I love writing. I have wonderful friends. I love all of my callings — both the official ones extended by my priesthood leaders and the ones the Lord has extended to me privately. I have a life filled with love. When my heart is full to overflowing with gratitude I express it in words, in thoughts, in prayers, in obedience to the commandments, and to the promptings I receive. Perhaps most importantly, I am filled with a desire to magnify my callings—wife, mother, writer, sponsor, and church callings—as a form of service to the Lord, to express my thanks. As I look for ways to magnify my callings, I become aware of areas for improvement; ways in which I can better perform that service. I try to live my life in a state of recovery, or, in other words, a state of repentance. To me, it is the same thing. At an earlier time in my life, finding an area with room for improvement might have filled me with guilt, discouragement and shame. Now I see that the Lord has opened my eyes to a new opportunity to show my gratitude to Him by seeking His guidance and following His direction as I work to grow and become better—to progress in becoming perfect (or complete)—as He and His Father are. What are you grateful for in your life? How do you express it? What opportunities do you have to magnify your callings – official and personal? 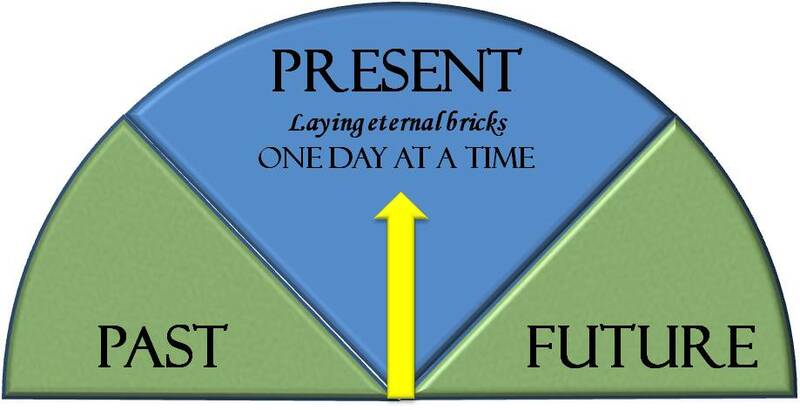 What will you do today to progress? In the ARP program, each of the steps is associated with a principal of the Gospel. Step 12 is called “Service.” I think it could just as easily have been called “Missionary Work” or “Endure to the End,” and I will write about those another time. 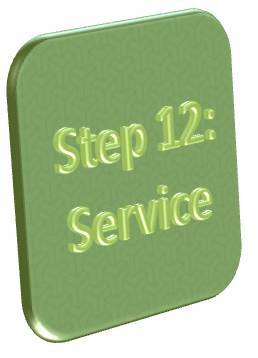 I attended an ARP meeting focused on Step 12 recently. As I listened to the step being read and to the other participants sharing, a flood of thoughts entered my mind about the many ways that we can serve within the program. Members of the Church talk about service a lot. There are so many opportunities for service in the Church and in the world. But for those of us whose lives have been changed by the ARP program, here are some ways that came to my mind that we can “give back,” thus expressing our gratitude to the Lord for this miraculous program of recovery. Without people coming to the meetings, there would be no meetings! If someone really needs a meeting and looks forward to it and they are the only participant when they get there, they are, at the very least, disappointed. Sometimes I don’t feel like going, but I have made a decision to attend certain meetings faithfully, which is a service to others while strengthening my own program. When I share my experience, strength, faith and hope at meetings or in private conversations it encourages newcomers who need to see living, breathing examples of recovery. Even those of us who have not yet achieved what we would call recovery can be examples of the determination to start again and keep trying. When I talk to people in the normal course of life, I frequently find that the ARP program comes up. That is probably because it is so important to my happiness and joy. 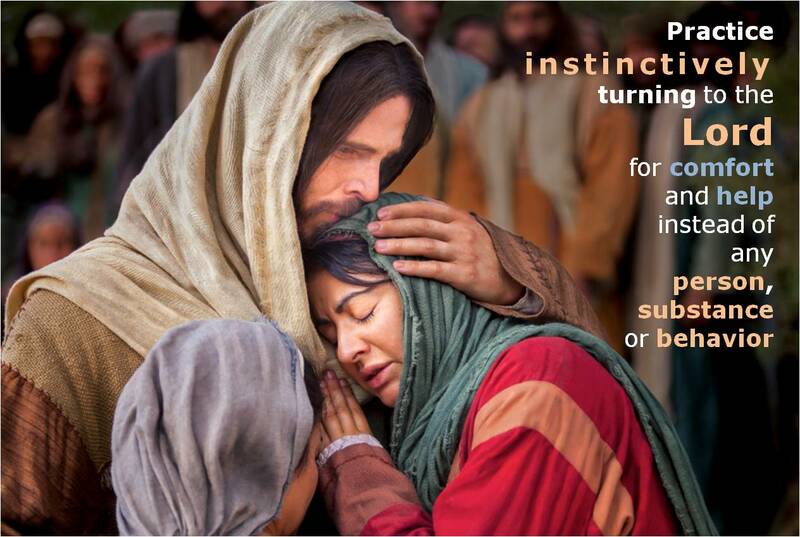 I hope that if they are struggling and would be blessed by participating in the program, their hearts may be touched and they, too might find peace by using the 12 Steps to learn how to better apply the Atonement in their lives. There are people who know I attend ARP meetings and have seemed curious about the program. When I feel inspired to do so I invite them to attend a meeting with me. It is hard for some people to go to their first meeting alone. What if they see someone there that they know, and are embarrassed? What will happen at the meeting? What if they are expected to share? These and many other questions can keep people from trying the program. When I invite someone to attend a meeting with me, it makes it easier and more comfortable for them to come. This is a service. Some people have transportation issues that make it difficult to attend meetings regularly. When you talk to other participants after the meeting you may become aware of this. Being willing to pick someone up and get them to the meeting can be a great service. If the program has made a big difference in your life, be open to bearing your testimony of that. Some of us do it in Testimony Meeting, others in smaller settings. Be open to the promptings of the Spirit, and seek the willingness to bear testimony of the program. On the Church’s ARP website there are wonderful stories shared by people who have received the gift of recovery. What a service to those who don’t know anyone in the program, or who have no meetings in their area or who cannot attend for some reason! Do you have a story of recovery? Would you be willing to share it? Here is a link to the page where you can submit your own recovery story. Share Your Story. A Support Person (called a sponsor in other 12-Step programs) shares their own experience to help guide others as they work the Steps. I have written recently about this and plan to write more in the near future. This is a form of service that blesses the life of the sponsor and much as it blesses the life of the sponsee. A facilitator is someone who runs the sharing portion of an ARP meeting. If you have been sober for 12 continuous months and are willing to attend a meeting regularly, you may be qualified to be a facilitator. If you feel inspired to do so, contact your Bishop or Stake President and let them know of your willingness to serve. They can give you a copy of the Facilitator Application, which lists all of the qualifications. A facilitator willing to share his or her recovery story and how they apply the steps to their own lives can provide a real service to those who still struggle. ARP meetings are conducted by Church Service Missionaries. These individuals or couples serve part time and live at home. They receive training on how to run a meeting. Sometimes they get to speak at 5th Sunday meetings or other meetings to share information about the ARP program with members of the wards and stakes from which their meeting participants are drawn. Please feel free to share in the comments below other examples from your own life of how you render Service within the program. I look forward to hearing your ideas! What kinds of service might you be able to give? Grateful for My Addiction! Are You Kidding Me? I have observed the incredulous look on the face of a newcomer who hears someone express, in a 12-Step meeting, that they are grateful for their addiction. I have also heard the same person, no longer a newcomer, share the feelings they had at that first meeting, and the gratitude they now felt for the path that brought them to the Lord, through the program. I was a member of the Church for fifteen years before I attended my first 12-Step meeting. I had learned about the Lord. I had learned about the Atonement. I understood what my spiritual goal was: to return to live in the Celestial Kingdom with my Heavenly Parents and the Lord in a state of exaltation. But I really did not understand how to get there. I was so imperfect. I knew it had something to do with the Atonement, but I didn’t know how to access that power. When I began working a 12-Step program I began to progress spiritually. I found a new understanding of what it meant to walk in faith and how to obtain it by working Steps 1, 2 and 3. I was able to really begin the repentance process and apply the power of the Atonement by working Steps 4 through 10. I learned how to receive personal revelation and connect with the Holy Ghost in Step 11. Finally, I learned about enduring to the end, service, and missionary work in Step 12. 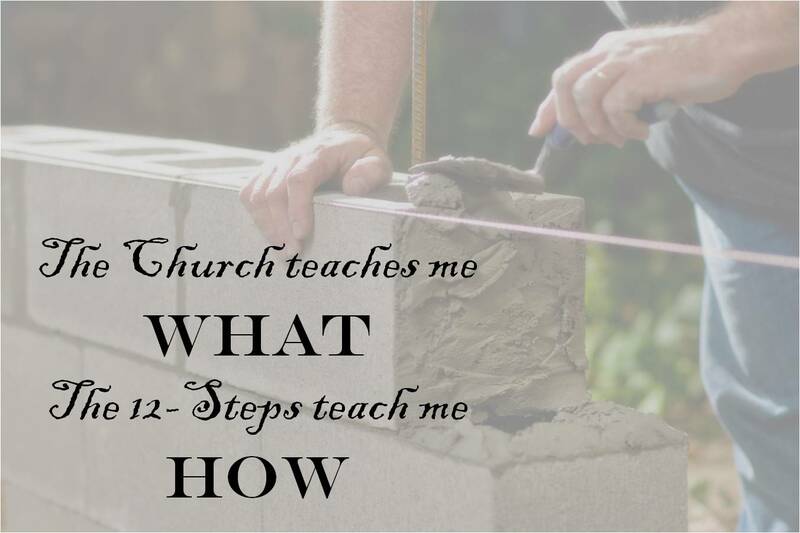 The Church taught me “What.” The 12-Steps taught me “How.” How can I not be grateful for the addiction that brought me to the Steps? When we give thanks in all things, we see hardships and adversities in the context of the purpose of life. We are sent here to be tested. There must be opposition in all things. We are meant to learn and grow through that opposition, through meeting our challenges, and through teaching others to do the same… When we understand this principle, that God offers us opportunities for blessings and blesses us through our own adversities and the adversities of others, we can understand why He has commanded us again and again to “thank the Lord thy God in all things” (D&C 59:7). Are you grateful for your trials/addictions? Write about your gratitude for the adversities that caused you to turn to the Lord. What difference has this made in your relationship with Him? If not, are you willing to become grateful? What footwork do you think the Lord would like you to do to help you feel gratitude for those things? Write about the relationship you would like to have with the Lord and how becoming grateful for your adversities might help that relationship develop. Tapestries are woven on a loom. Like most textiles created on a loom, the weaver sees the tapestry from the back side as he weaves. One of the things that makes a tapestry unique is the design, often representational, using tiny threads of different colors to create a picture. In life, we are like the threads of a great, God-woven tapestry. We each have our own unique color and texture which we add to the beautiful picture as God weaves us into the fabric of life. Sometimes we travel, for a time, with certain other threads, whose path is parallel to ours in the design. Then our paths may diverge as we (or they) are taken over to another part of the tapestry for awhile. There will be some whose paths cross ours repeatedly; not traveling together but bumping into each other from time to time. What makes it hard for us is that we cannot see the front of the tapestry while we are in this life. Rather than seeing the beautiful picture we are helping to create, we see the somewhat chaotic, seemingly random underside of the tapestry. We wonder why some people are in our lives, and why others have drifted away or have been removed from our lives entirely. We may feel like our own thread is going nowhere, or around and around in circles. When we get to the other side of the veil, we will see the tapestry from the front, and we will understand why we needed to have these experiences. We will be able to observe first hand the beauty that has been created out of our lives by the master-weaver’s hand. And we will feel joy, happiness and gratitude that God has indeed had a plan for our lives all along. Identify people in your life who travel the same path, no longer travel the same path but once did, or cross paths with you briefly from time to time. 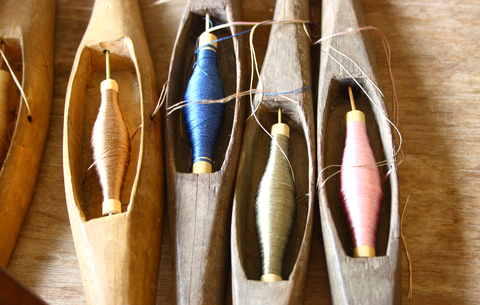 How does it make you feel to think of them as threads in your tapestry? Can you catch a glimpse of or even try to imagine what the front of the tapestry looks like? Describe the beauty in your corner of the tapestry.